Early last week we began the installation of Judy Millar’s Giraffe-Bottle-Gun.Giraffe-Bottle-Gun was Judy’s project for the last Venice Biennale and was on show in Venice, Italy from June to November 2009. The works are scaled up versions of her paintings – scanned and enlarged by computer, then printed onto the same vinyl used for billboards. Judy had specially made shaped plywood frames to stretch the vinyl over. 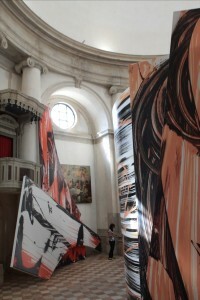 The works are between 5 and 8 metres on their longest side. They are made to be installed almost any way and there is not necessarily a right way up. When installing them Judy works with the space to engage with the archtitecture and create a situation where the works are responding to the pecularities of that space and of the experience of being in it. The other major part of Giraffe-Bottle-Gun is the cylindrical painting. It is made by the same proces as the other works, but the vinyl is stretched over a 5 metre high and 6 metre in diameter wooden frame to make a towering cylindrical structure. It’s not quite a cylinder though – there is an ovelapping part. The shape is based on a curled strip of paper. 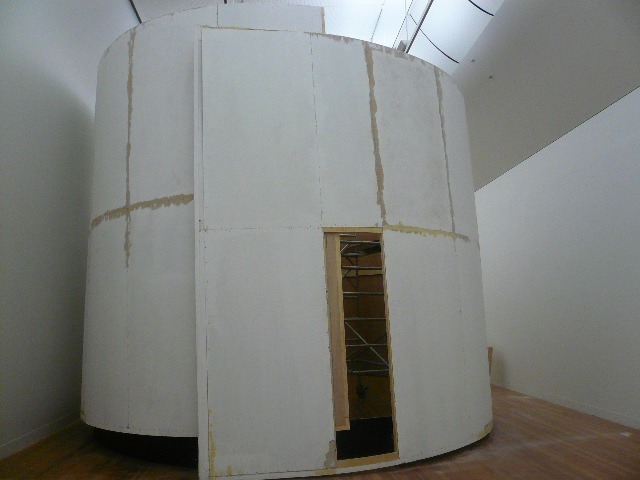 Scaffold is assembled inside the cylinder and a scissor hoist is used outside to attach the ply panels. The cylinder almost completely assembled. 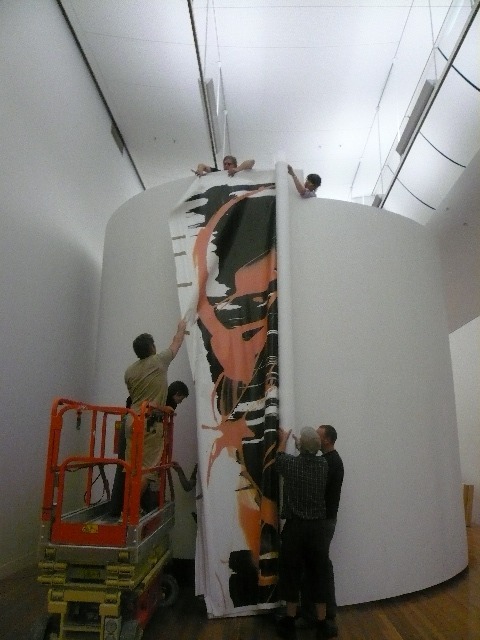 The installation team has been assembling these in preparation for Judy’s arrival this week. The team has been working to Judy’s layout plan that she sent through earlier on. Once it is all laid out we will work with Judy to make any adjustments to where the works are placed and make the decisions about the final layout of the exhibiton in time for the opening on Friday 26th February. The photography team has been up in the space too and they have set up a camera to record the installation as it progresses. Once the installation is completed we will do a short video interview with Judy which will be available here on the Blog through Te Papa’s YouTube page. So now you have seen the progress shots come back soon to see the video footage and if you are in Wellington come and see the show. 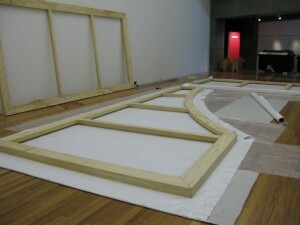 It is on show here in Toi Te Papa, Level 5, until 15 August 2010. 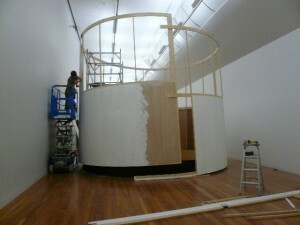 For more information about the New Zealand at the Venice Biennale 2009 exhibitions follow the links below. Martina, thanks for your comment. I have just made another post today about the two New Zealand projects from the 2009 Vencie Biennale. Thanks for your comment, good to hear from you. We are working on the videos right now, so stand by. I will be making another post with images of the completed installations this week. I do hope you can make it down here to see the exhibition – you have until 15 August!